Description:Children's football shape sofa with matching Ottoman is a fun and multi-functional addition to any kids room. It makes a great reading seat or for putting your feet up in front of the TV. Kids can kick back in the chair form and use the accompanying ottoman to rest their feet after a long day of play. Ideal for any children's bedroom or playroom! Get one for your kids. They will love it! Cartoon Design- The whole sofa is designed in soccer shape, just like that you are in a cartoon world. The right size and texture just for baby to have a rest and let your baby has his/her own small world. 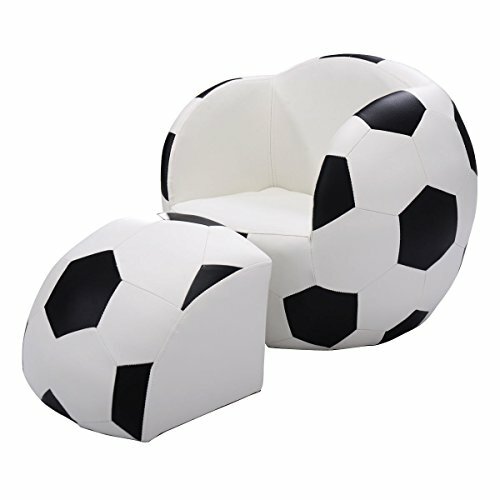 Space-saving- Costzon soccer sofa chair is an ideal space saving furniture. We attach importance to every details of this sofa furniture to the comfort of the sofa, which is great for your baby watching TV or reading a book. Ergonomic Design- The design of soccer style makes better support, the exquisite radian and comfortable material will make your children enjoy it. Easy to move- Made of wood frame+ sponge+ PVC, a foam core to keep kids comfy and a sturdy wood frame to withstand heavy use. Where ever you go, such as living room, bedroom, or the balcony, the light weight makes you are easy to move. Keep it Clean- Suitable for indoor and outdoor use, it may easily get dirty. Don't worry, the fabric is easy to clean and resistant to soiling.